Paul Patin is a French actor/singer/dancer who has performed around the world with international companies for more than 10 years. Discovered as an insane clown by Lucy Hopkins, he started to create cabaret solo shows. 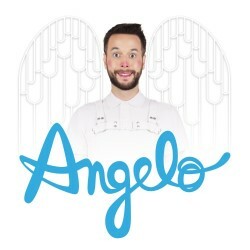 Angelo is a fallen angel from the sky. He finds his way by helping human people to get back their ability to fill each other up with love. To do this, he built a Love Workshop using object lessons, exhibitions, group experiments and practical exercises.